Hosting another Ctop and Quilt! So far it's awesome but my feet really hurt. Why can't this concrete/tile floor be made of memory foam? We had a great meal tonight for the first supper together. We made ham, hashbrown casserole (a favourite! ), corn, and Caesar salad. Lots of compliments and it goes over really well! 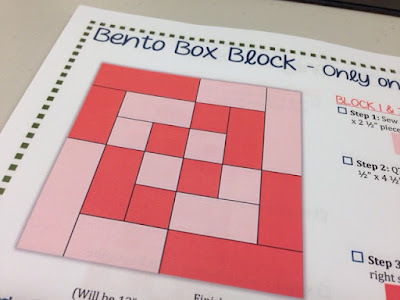 Anyway, tomorrow I am doing a tutorial on the Bento Box Block. It comes together so easy and so fast! I am going to post the tutorial in my etsy shop soon.